There was a considerable amount of turnover in our business continuity/backup and disaster recovery (BDR) category this year. Only StorageCraft was a repeat winner. One trend that did continue from past years was the scoring in this category, which was considerably higher than in other categories. Across-the-board, the BDR vendors earn high marks, indicating they are doing a great job overall. Within the labeling category, both Best Channel Vendors were repeat winners from last year. Both companies earned the highest marks in product features and reliability. Within the ECM (enterprise content management) category, we had a couple companies fall off and a couple new ones enter the ranks of winners. General Computing was one of our largest categories at 37 vendors. This year, we saw some changes, with five companies earning high enough marks to make the list. Intel and Lenovo were repeat winners, while Logitech, Samsung, and ViewSonic were new to the list this year. Within the network security category, the winners were all repeats from last year. That says a lot, as the security industry saw a lot of innovation this past year. Clearly, the winners here are taking steps to remain relevant. The POS hardware category, always one of our largest, remained pretty much the same, with APG Cash Drawer making the list again after a brief absence. Within the software category, there were no changes from last year. In both POS categories, with the amount of change taking place in the industry, it’s impressive to see these winners stay on top. We made some changes to the presentation of results for managed services this year. With some products now blurring the lines between PSA (professional services automation), RMM (remote monitoring and management), and other managed services tools, we thought it best to combine the vendors into one category. In speaking with VARs, integrators, and MSPs, video surveillance and unified communications (UC) are two growth sectors in which many are finding success. Within video surveillance and access control, not every vendor wants to work with IT solutions providers. Some prefer their old video dealer network. The vendors who made our Best Channel Vendors list are ones you can safely approach for potential partnership opportunities. How were the Best Channel Vendors survey and special report generated? For the eighth consecutive year, we relied on the wisdom and experience of Penn State University to help ensure the survey’s statistical accuracy. Back in 2009, Penn State agreed with our philosophy of conducting a Web-based survey (as opposed to a phone-solicitation survey) of our subscribers to capture significant data from our most active resellers. The technology categories were determined by Business Solutions Magazine’s (BSM) editorial staff. Who participated in the survey? How did they vote? Channel Friendly: Are they loyal to you and their other channel partners? Do they avoid competing with you, not unfairly selling directly? Do they push business toward you, instead of quoting prices to end users? Channel Program: Are you satisfied with the variety and quality of services they offer (e.g., reduced shipping, marketing funds, VAR rebates, lead generation, etc.)? Do they effectively and consistently communicate program changes? How many VARs participated? Did you throw away any votes? A total of 2,685 people participated in this year’s survey, but we eliminated ballots from voters who did not qualify as resellers. In all, 5,382 validated votes were cast in the survey. How were the Best Channel Vendors determined? An overall average score for each vendor was determined by adding the cumulative scores of the seven categories and dividing that score by the number of VAR subscribers who rated that product. From that list, our editorial staff chose the Best Channel Vendors by applying a “Scree Test.” We won’t go into the full definition here — we’ll leave that to the Penn State statisticians to explain — but basically our editors applied reasonableness to the results and drew the line where there was a clear break between the highest scorers and the “rest of the pack.” Our goal was to reflect the sense of the survey respondents and let our readership know who they felt were the Best Channel Vendors. 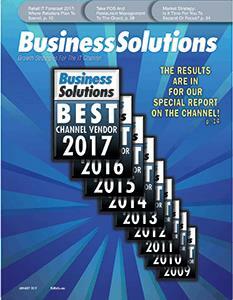 Those familiar with our past Best Channel Vendors surveys might remember that our previous results included the top 15 percent of vendors in each technology category and that last year we tightened the grading criteria and chose the top 5 percent of channel vendors based on reader feedback. We continued that tradition for this year’s results. How are the Best Channel Vendors listed? They are listed first by technology category (Business Continuity through VoIP [voice over Internet Protocol]) and then by technology subcategory. Best Channel Vendors are listed in alphabetical order. We did not rank them according to their overall average score. One of the main purposes of this special report is to give our resellers a guide to who their peers think are Best Channel Vendors. Ranking vendors according to their overall average score would mislead readers and defeat that purpose. Did you “fudge” any scores to make sure your advertisers were included on the list? Did any vendors buy their way onto the list? No. Other magazines have skewed their surveys to include current advertisers or entice new advertisers. We believe engaging in that behavior is not only a disservice to the industry, but it’s also dishonest. We would not compromise the reputation our magazine has built over the past 30 years for the extra revenue a few ads would generate. OK, so the survey is accurate. But is it perfect? Certainly not. Penn State’s statisticians stressed to us that all surveys have their limitations. This survey is not perfect, but it should be an excellent tool for the channel because it indicates products and vendors that have highly satisfied VARs. What should I do if I have a comment about this special report? Please call BSM Publisher Tim Ulrich at (814) 897-9000 x245, or drop him an email at Tim.Ulrich@BSMinfo.com.